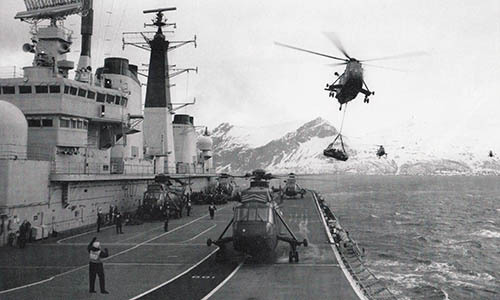 Flying operations off Norway during Exercise TEAMWORK 90 - September 1990. 3rd January - Christmas Leave ends. 16th - 25th January - At sea for Shakedown. 25th January - Portsmouth for defect rectification and preparations for COST. 30th January - Sail for weopons training in South Western Approaches. 5th - 22nd February - Continuation Operational Sea Training (COST) at Portland. 23rd - 26th February - Visit to Copenhagen. 26th February - Commence Aviation Work Up. 13th - 15th March - Operational Readiness Inspection. 17th March - Portsmouth for Short Maintenance Period and Easter Leave. 18th April - Sail from Portsmouth for WESTLANT 90 deployment. 21st - 26th April - Excercise JOLLY ROGER in Gibraltar Exercise Areas. 1st May - PASSEX with French naval carrier group led by FS Foch. 9th - 14th May - Visit to New York City. 19th - 30th May - Visit to Mayport, Florida for a maintenance period and station leave. 3rd - 5th June - Group Anti-Submarine Warfare Exercise. 5th - 15th June - Exercise MARCOT with the Royal Canadian Navy. 15th - 19th June - Visit to Halifax, Nova Scotia. 4th July - Portsmouth for Base Assisted Maintenance Period (BAMP) and Summer leave. 21st August - Visit to the ship by Lord Mayor of Leeds. 25th - 27th August - Portsmouth Navy Days. 3rd September - Sail from Portsmouth. 6th - 17th September - Exercise TEAMWORK off Norway. 20th - 24th September - Visit to Oslo. 9th October - Families Day at sea. 15th October - Sail from Portsmouth. 22nd October - Arrive in Gibraltar. 23rd October - Captain Neil Rankin joins as Commanding Officer. 25th October - Sail from Gibraltar. 29th - 31st October - Self noise trials off Portland. 1st - 7th November - Portsmouth. 7th - 16th November - FRS-2 Sea Harrier sea trials. 16th November - Portsmouth for maintenance and Christmas leave. December - Maintenance and Christmas leave.